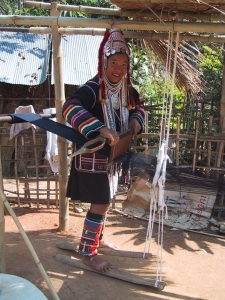 When I was visiting northern Thailand, I wanted to learn how to spin using an Akha spindle, which of course meant finding someone from the Akha hilltribe to teach me.Â I asked around a bit, and finally wangled an opportunity to spend four days studying spinning and weaving with Ahta, my guide’s mother-in-law. 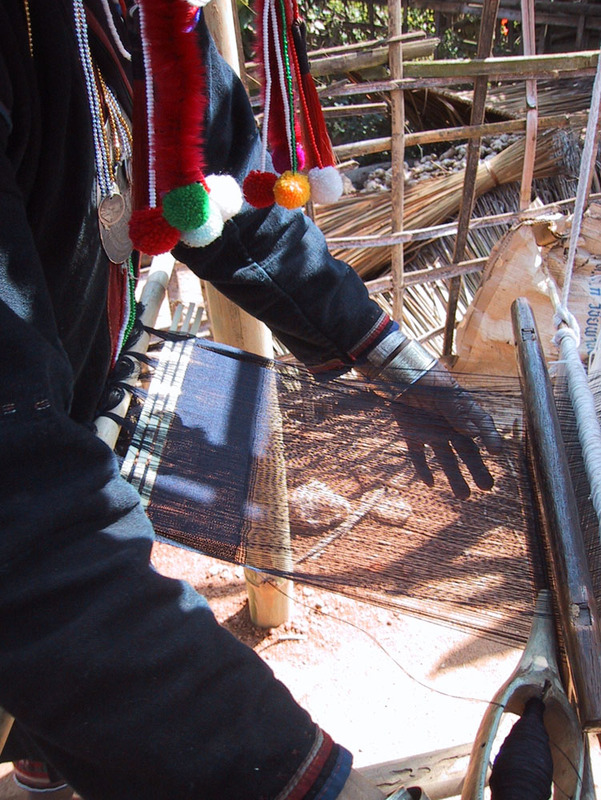 It was one of the best experiences of my entire trip.Â While I wasn’t a weaver at the time, I took copious photos of the weaving process, in hopes of being able to reproduce it someday.Â Now that I am a weaver, I appreciate it all the more. 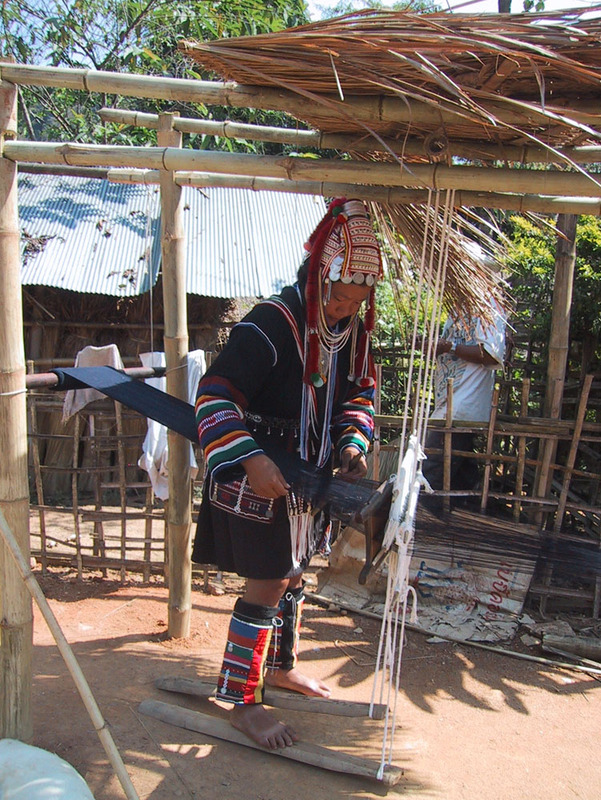 The Akha loom is really interesting, and worth a closer look – the two final photos in the gallery show the entire loom. 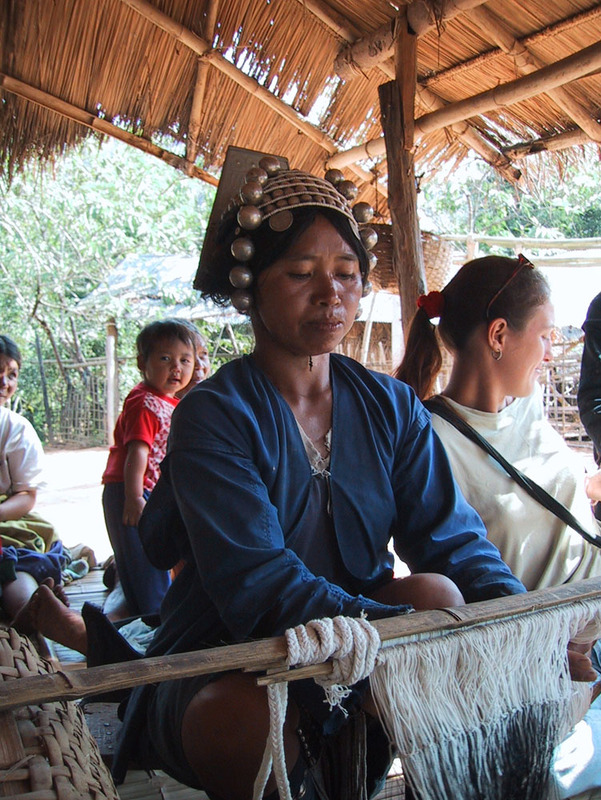 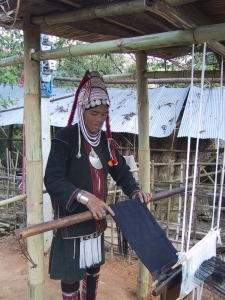 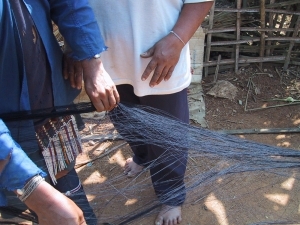 As far as I know, the Akha only weave plainweave, in indigo and white – embellishments are made in embroidery afterwards. 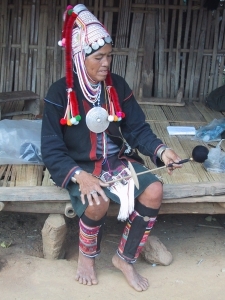 You can read more about my adventures with the Akha in the Thailand section of my travel blog. When advancing the warp, it is simply untied from the back post and retied at a convenient point. 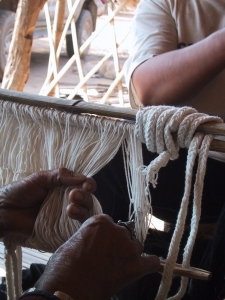 The untangling process needs to be repeated each time the warp is advanced, making advancing fairly time-consuming. 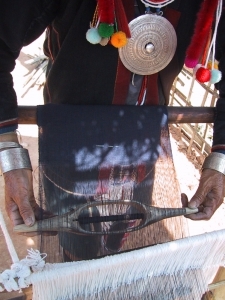 A closeup of the brake. 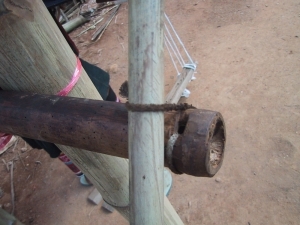 This is the brake for the cloth beam. 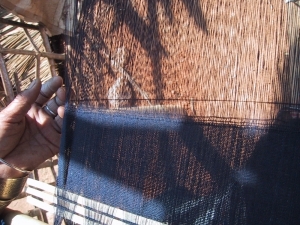 The web forming on the loom. 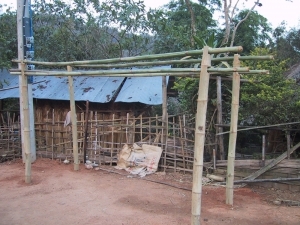 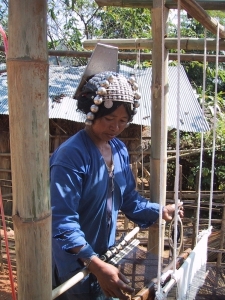 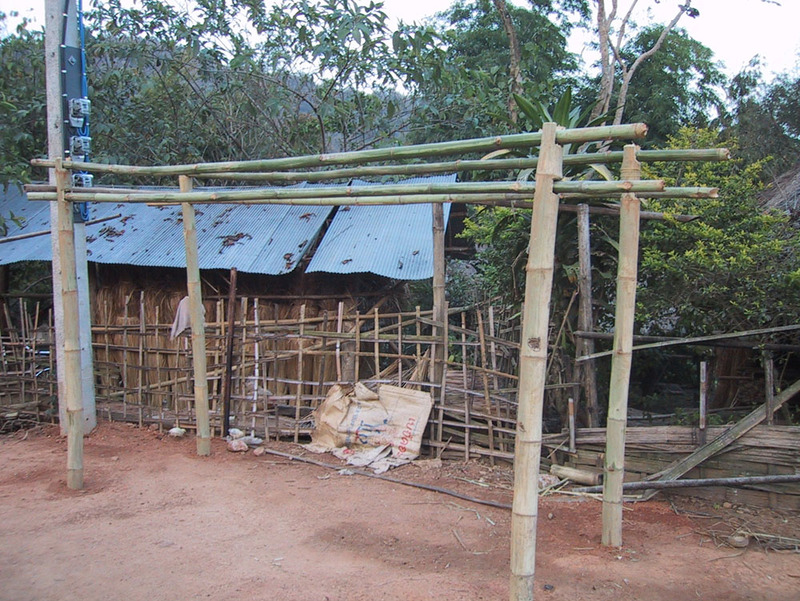 The frame of the loom, basically a set of bamboo posts set in the ground. 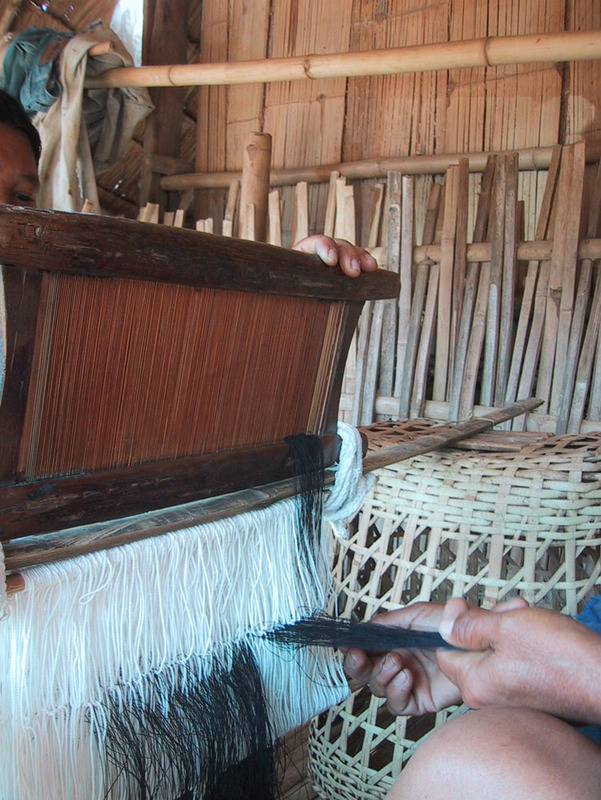 A view of the full loom, for those interested in reproducing it. 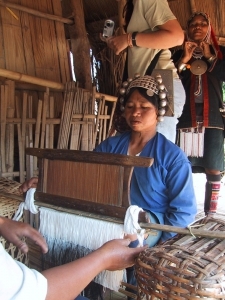 A closeup view of the threading process. 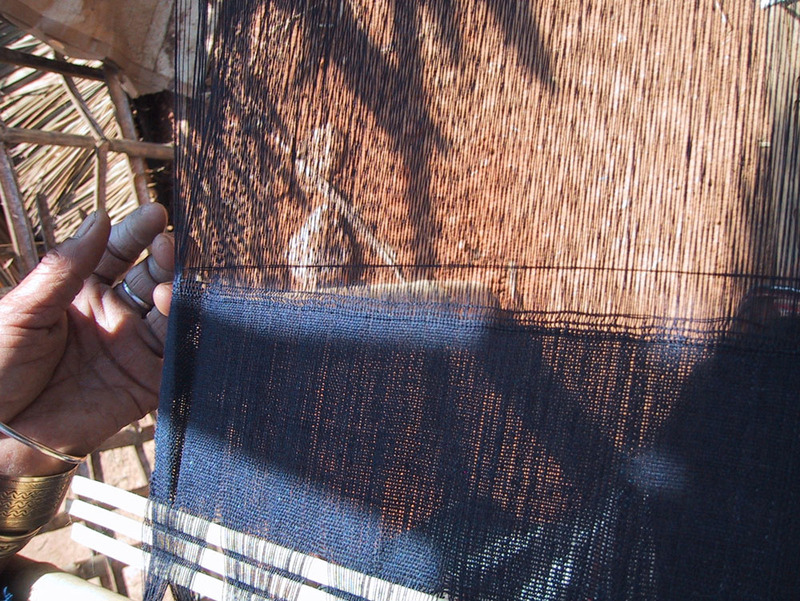 This is all plainweave. 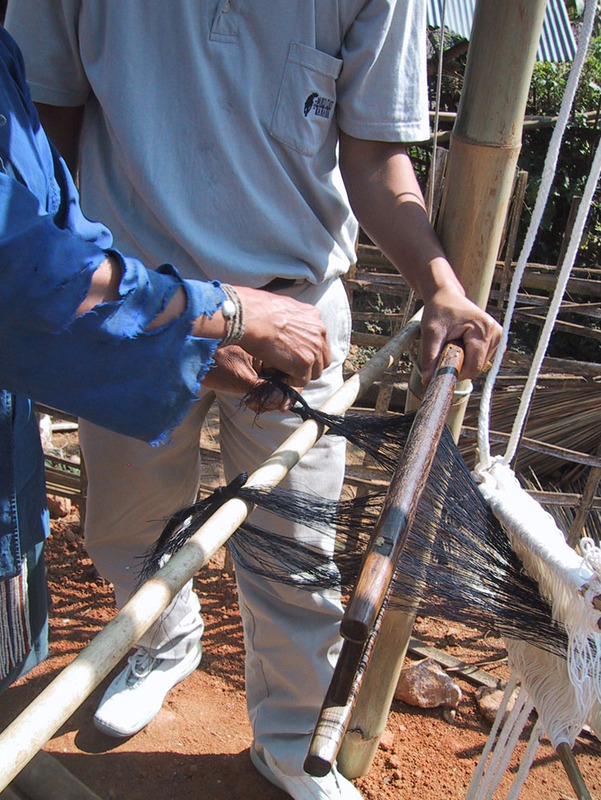 Here they are setting up the heddles for threading. The heddles are hand-tied out of cotton string. 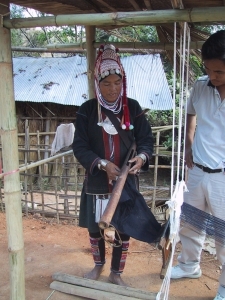 A broken thread is repaired by fastening it to a needle thrust into the cloth. 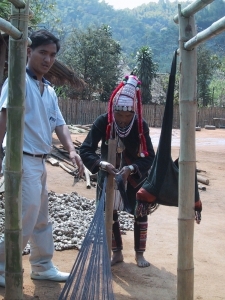 ...and is rolled onto the beam. 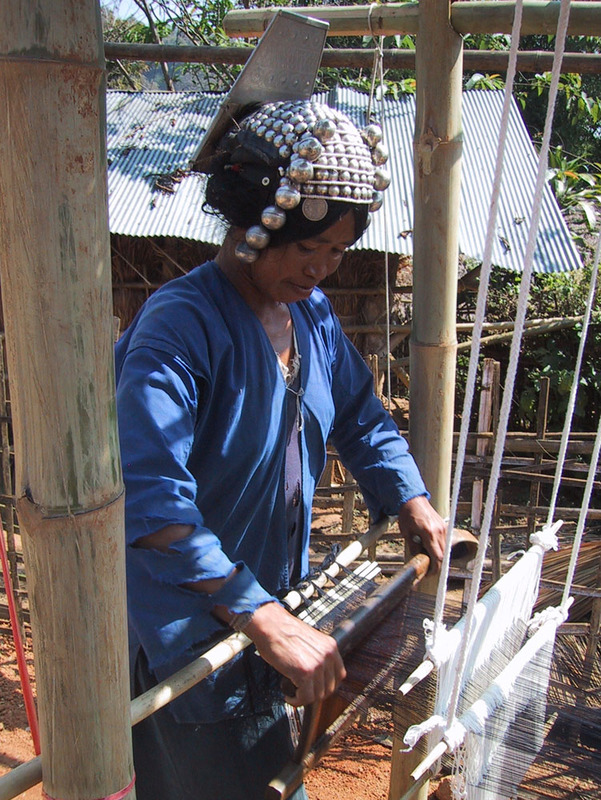 The shuttle, of hand-carved wood. I'm still kicking myself for not buying one. ...slips it over the quill so the first person can pull it through. 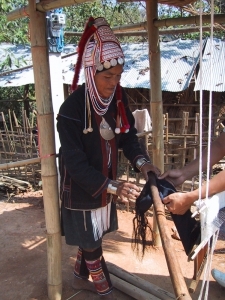 Setting up the reed for sleying. The reed is a wood frame with pieces of split bamboo or reed as separators. 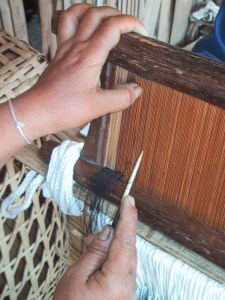 The cloth is threaded through the slot to hold it on the beam. 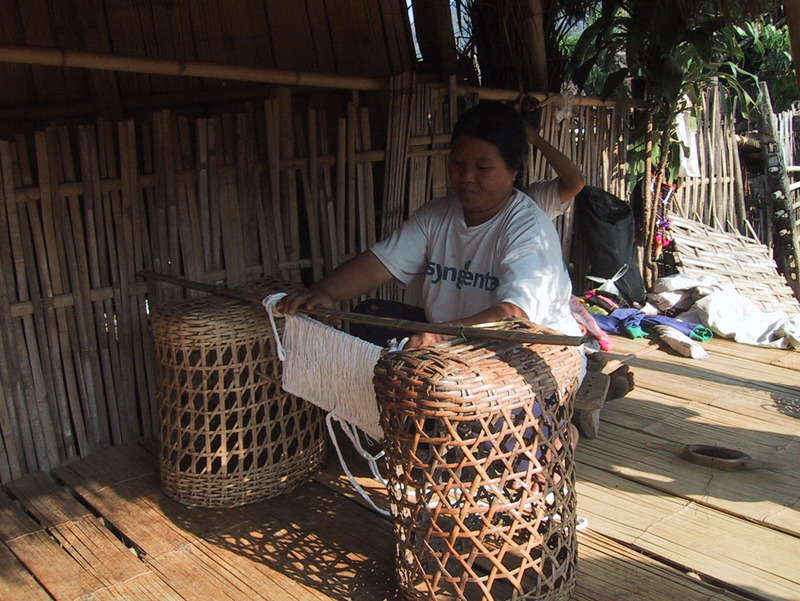 Starting to thread the heddles. 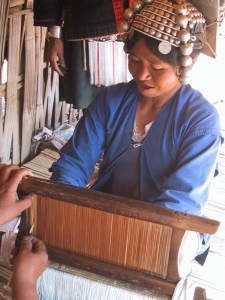 One person opens the heddle and reaches through, the other person picks out a warp thread and gives it to the threader. Throwing the shuttle through the shed. Don't I make a fine Akha woman? 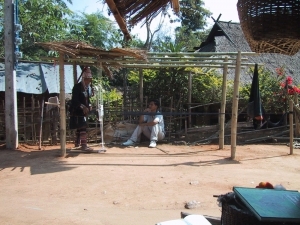 East meets West....or does it?? 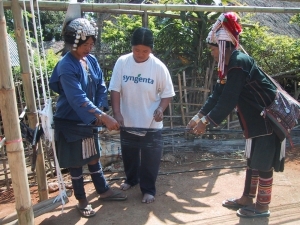 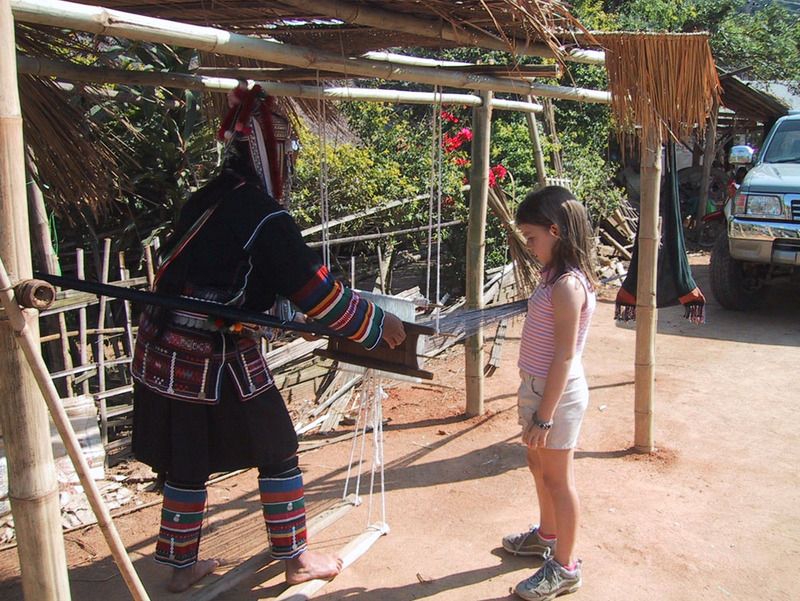 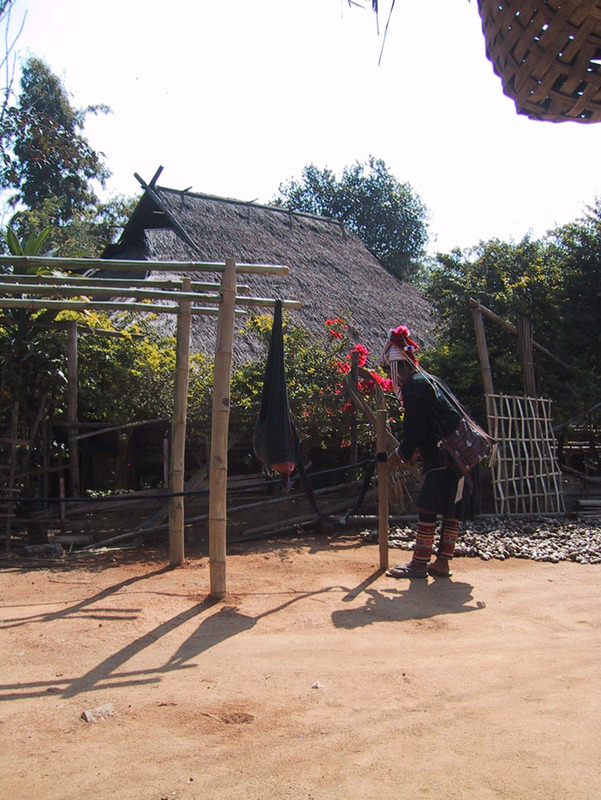 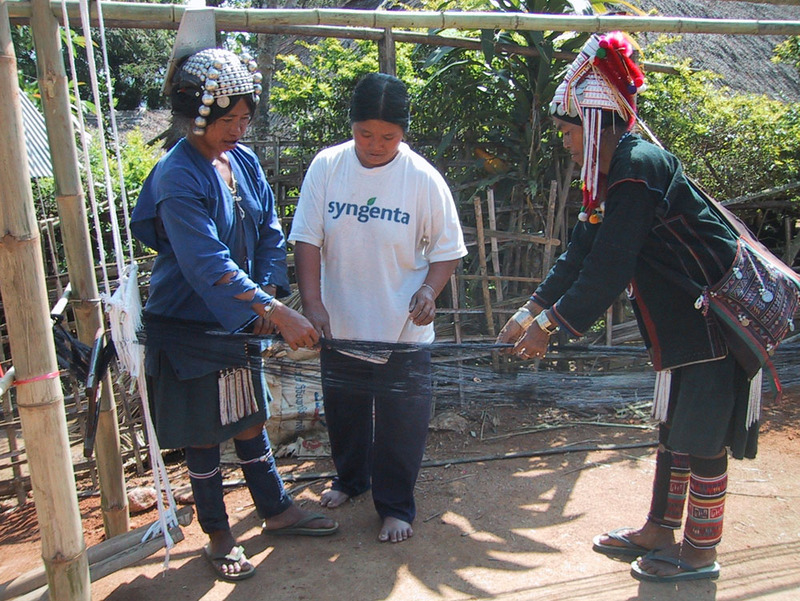 On the last day, they dressed me up as an Akha maiden and put me out front to weave for the tourists. 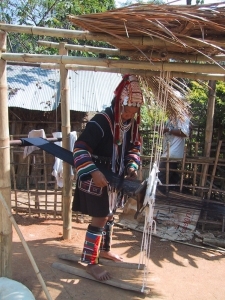 Me attempting to weave on the loom. 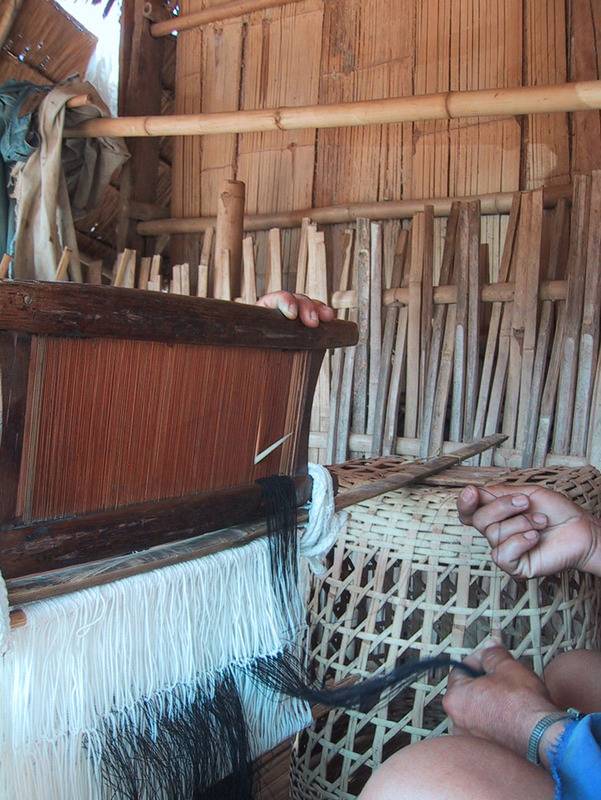 A view of the loom showing the heddles and reed. 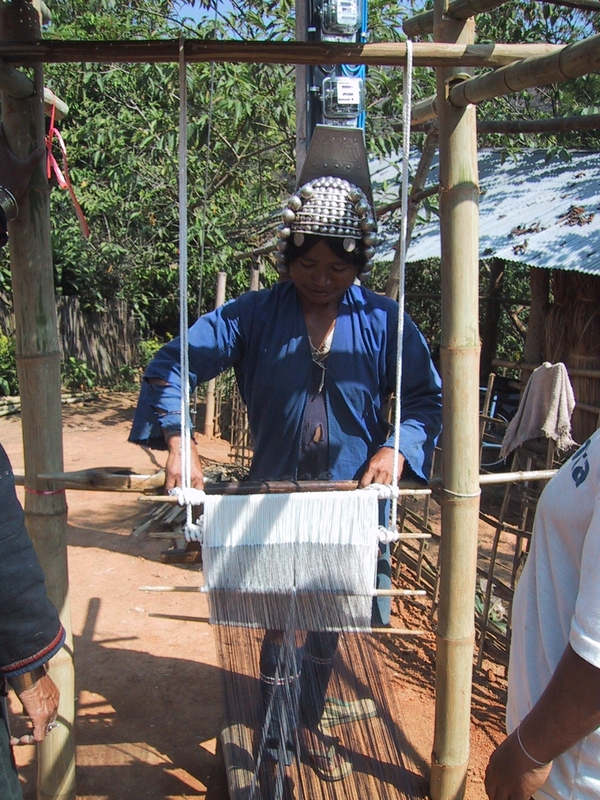 Notice that they are suspended from a pole that goes crosswise across the top of the loom. 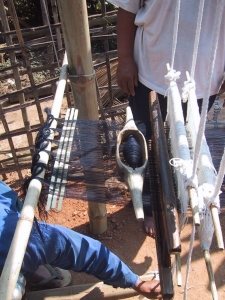 When done weaving for the day, one simply removes the pole, unties the warp, and rolls everything up into a bundle, leaving only the frame of the loom. 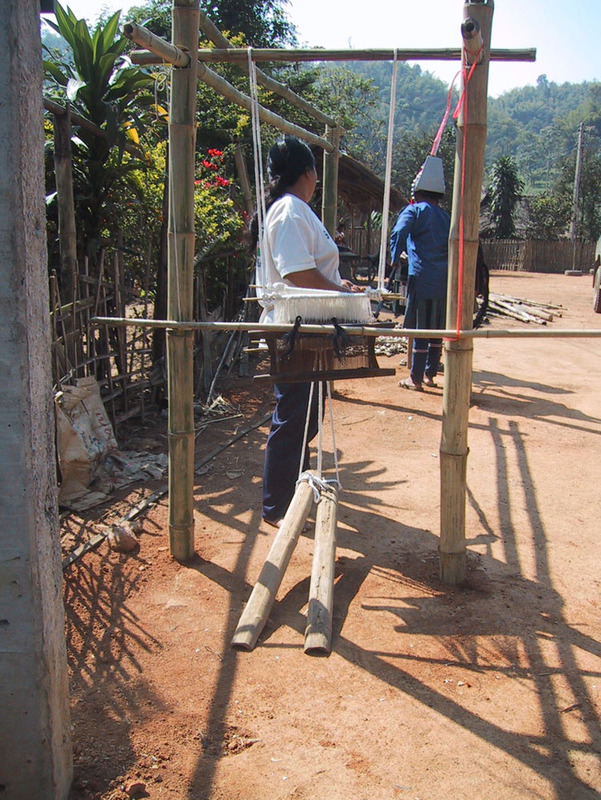 This is handy if you are itinerant! 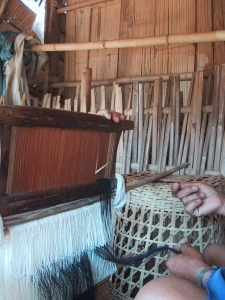 A second view of the entire loom. Tying onto the back beam. 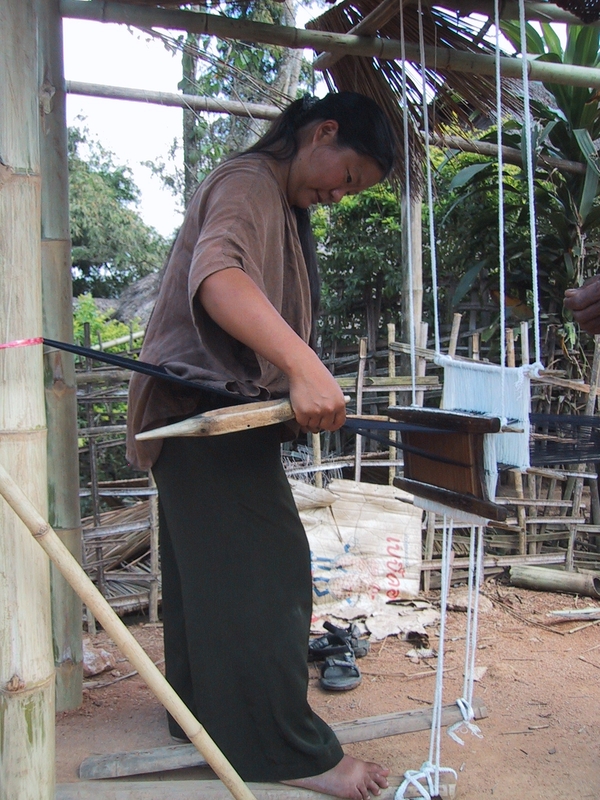 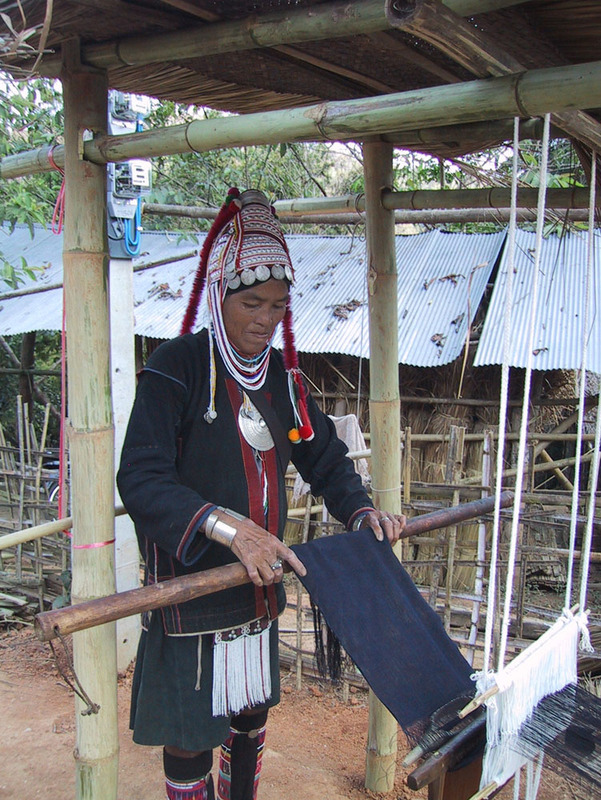 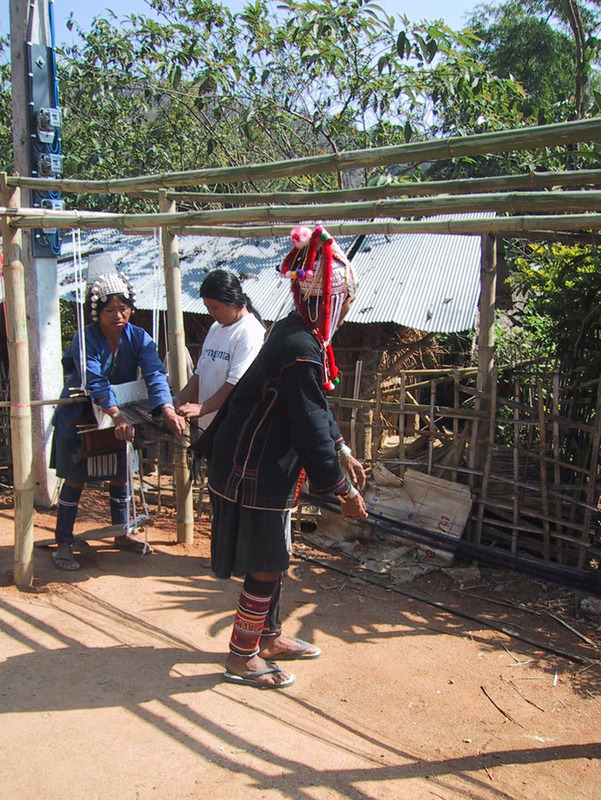 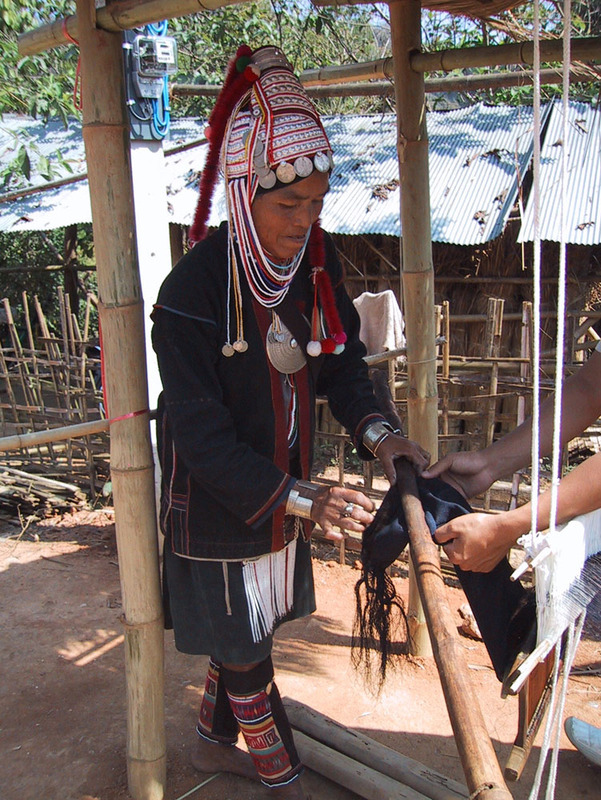 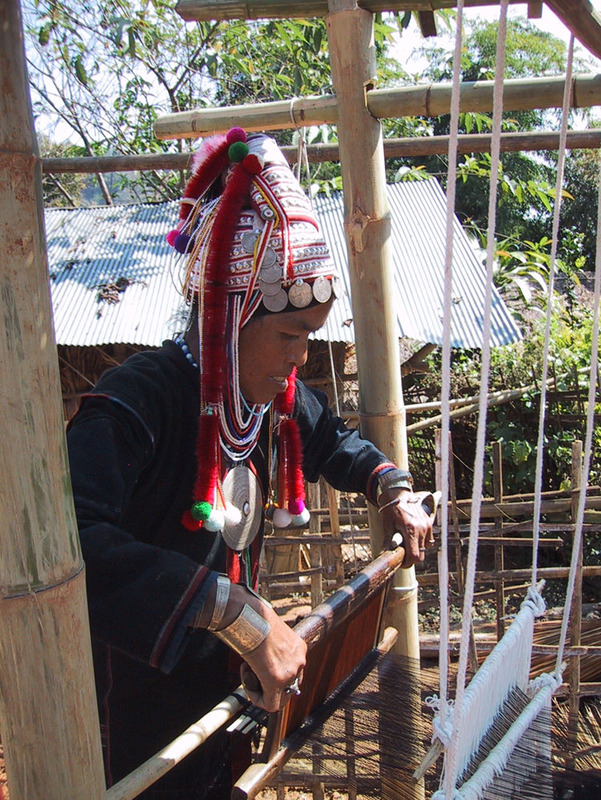 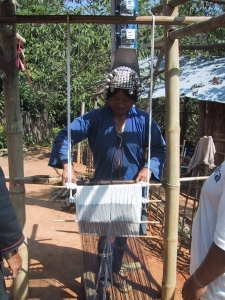 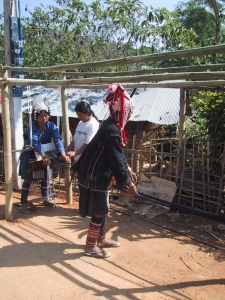 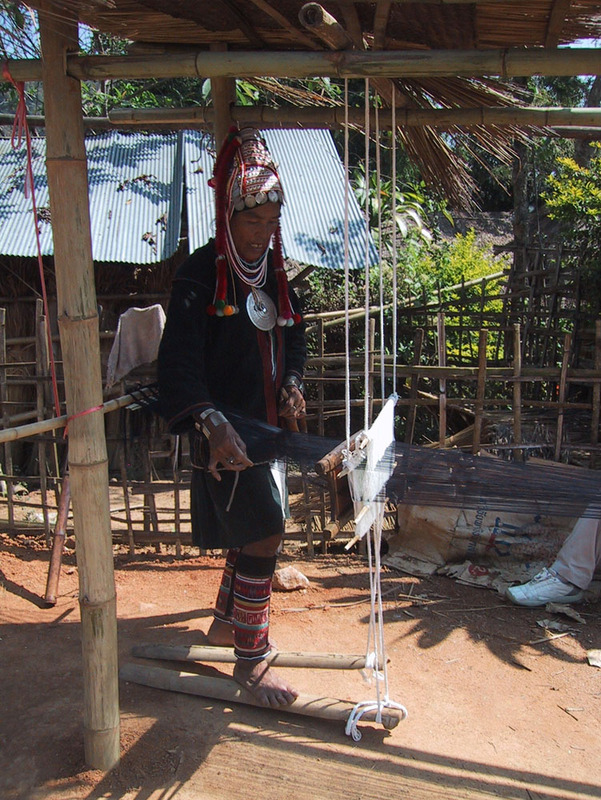 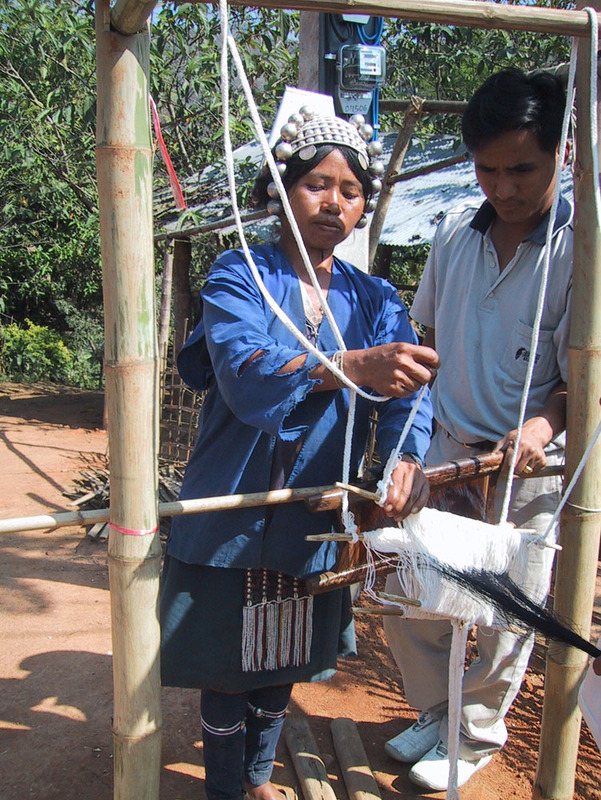 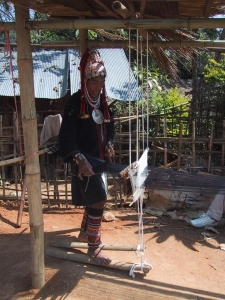 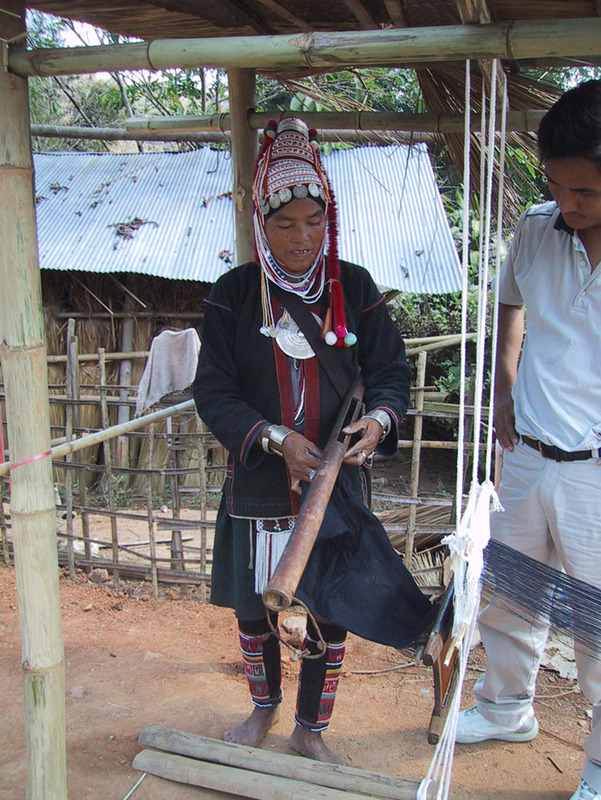 The Akha do not have a neatly wound warp beam; their warp is wound, then thrown into a bag for storage. When needed, more warp is drawn out of the bag and tied around a post stuck in the ground. 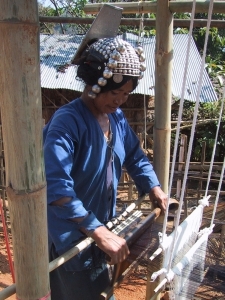 Setting the shafts, reed, and treadles into the loom. Tying onto the front beam. 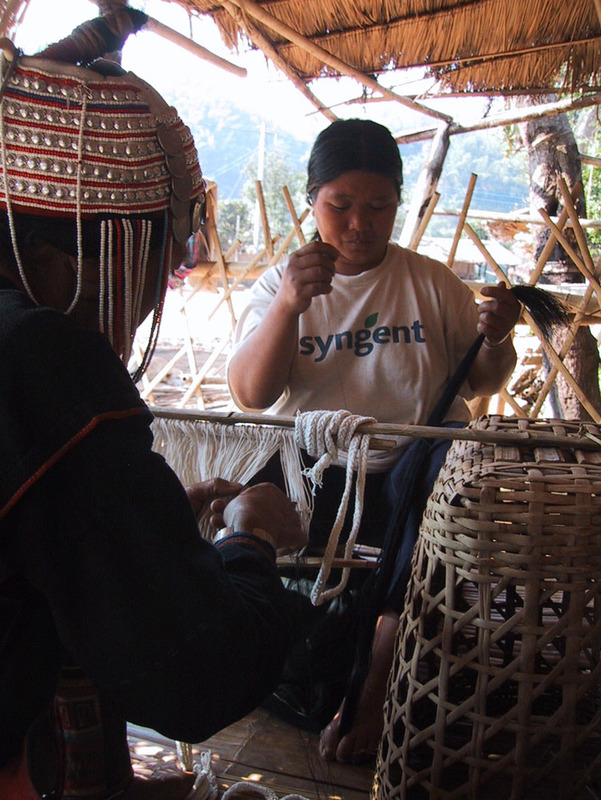 More hands make the work go faster. 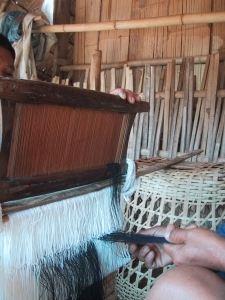 The warp is being loosened up and the tangles worked towards the back of the warp. This warp would have a Western weaver in conniptions, with all the crossed threads - but it all seems to work out in the several yards between the heddles and the post to which the warp is tied. 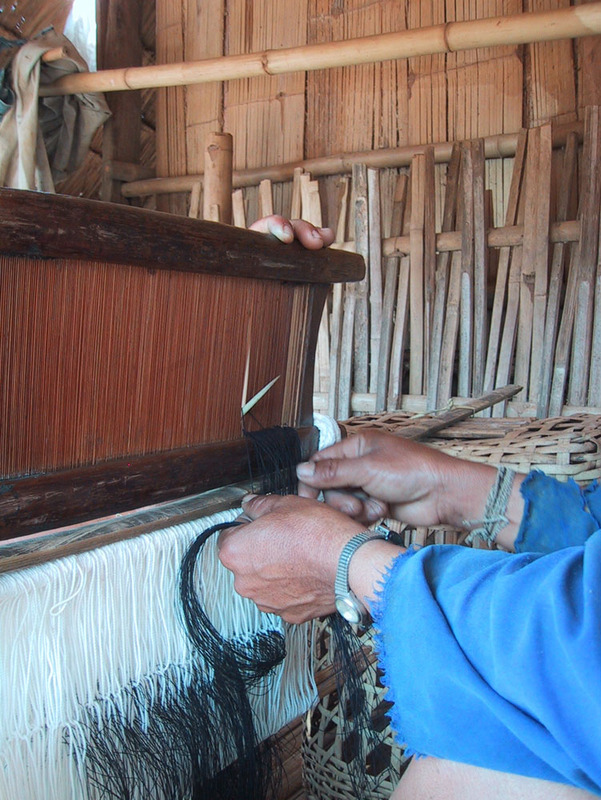 Of course, not having a neatly arranged warp leads to tangles. Here the weaver is starting to untangle the warp. 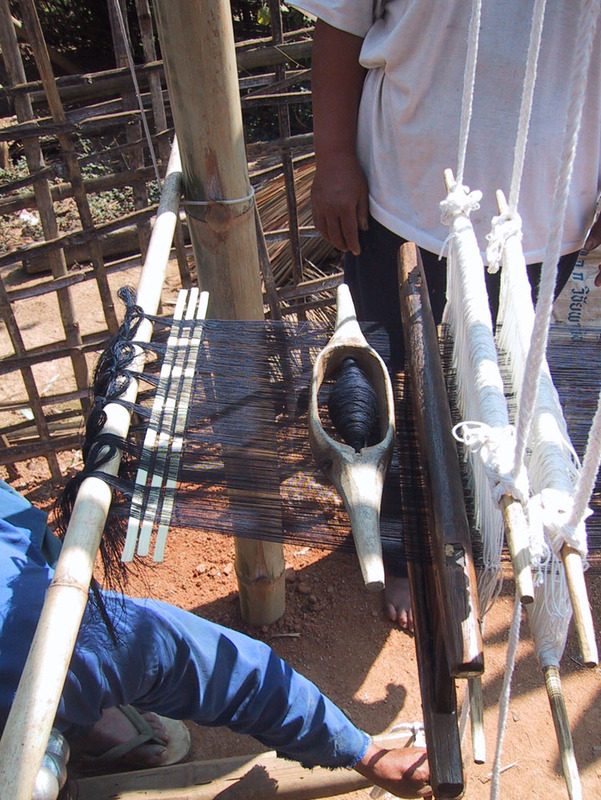 After enough length is woven, the cloth beam is added. It is a bamboo pole with a slot cut into the pole. 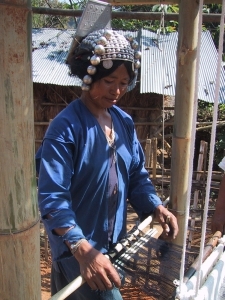 Another woman weaving on the same loom. My teacher weaving on the loom. 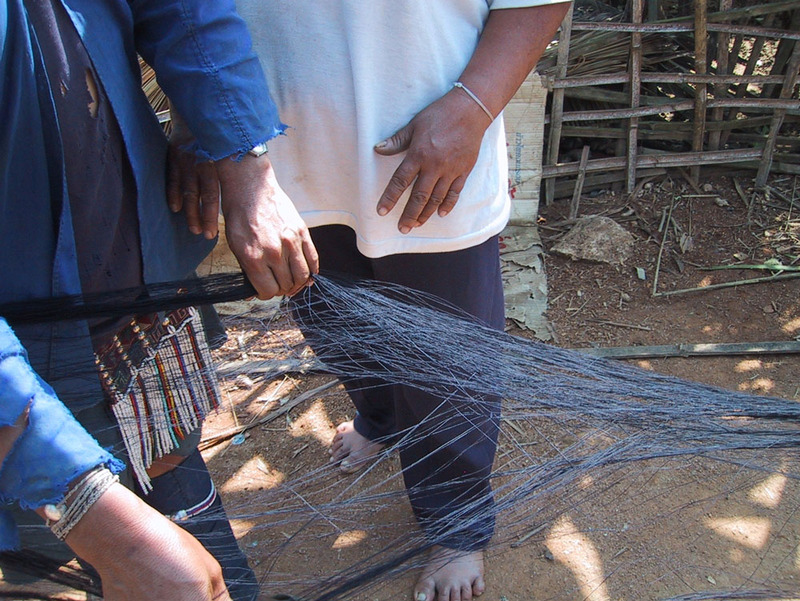 Starting the weaving, by weaving the stick header. 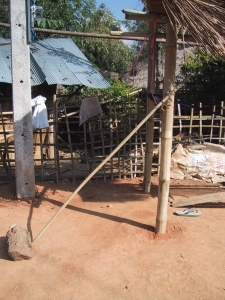 Beating the pick. Notice that the reed is hanging suspended, not fixed in a beater. Weaving along. As the cloth grows longer, instead of advancing the warp the weaver simply moves forward along the loom. 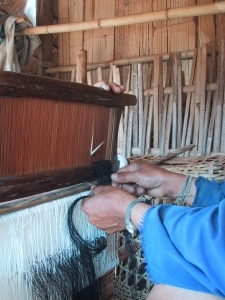 When it becomes inconvenient to weave any further, then the warp is advanced. Advancing the warp requires considerable fiddling because of the tangles, so it is done only every couple of feet. 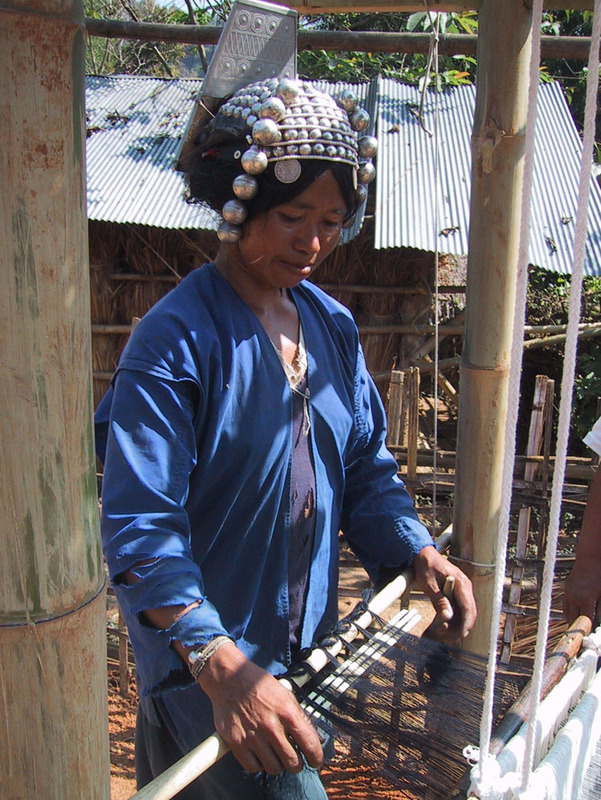 She was unbelievably fast at winding bobbins using the spindle against her thigh. I tried, but was much slower.